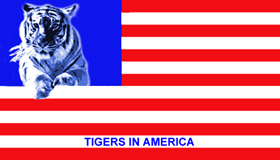 PEIVDF is proud to be working with Tigers in America. Tigers in America works tirelessly to improve the lives and end the suffering of the thousands of captive tigers in the US by working to relocate them to the best sanctuaries in the US able to care for them. Tigers in America is sponsoring a portion of our work at any of these sanctuaries.